We are nominating Dr. Kaitlyn Kelly Gabe to be an Escanaba Success Story. Kaitlyn graduated in the top ten from the Escanaba Senior High School in 1996. She was a member of the National Honor Society and was senior class vice president. Other activities that Kaitlyn participated in during her years at the Escanaba Senior High School include: Key Club, Ski Club, “E” Club, basketball, cheerleading, track and cross country. Her love of cross country continues today as she is still a long distance runner. She has completed the New York City, Chicago and Boston marathons. After graduating from high school, Kaitlyn entered the pre-med honors program at Albion College. She graduated number one in her class from Albion in May, 2000. Kaitlyn then entered medical school at New York Medical College in Valhalla, New York. During her time at New York Medical College, she did two research fellowships. One fellowship was completed at MD Anderson Cancer Center in Houston, Texas and the other at the University of Manchester in the U.K. It was during these fellowships that Kaitlyn realized she was interested in the field of surgical oncology. She graduated junior alpha-omega-alpha and received her M.D. in 2004. She then matched for general residency at St. Vincent’s Hospital in Manhattan. Kaitlyn was at St. Vincent’s from 2004 to 2006. She entered a basic science research fellowship under Dr. Yuman Fong at Memorial Sloan-Kettering Cancer Center in New York from 2006 to 2008. While at Memorial Sloan-Kettering, she worked on oncolytic viral therapy for cancer (a novel cancer treatment that is now in early stage clinical trials). She also published 12 peer reviewed studies on viral therapy. St. Vincent’s had financial trouble and eventually closed. Kaitlyn transferred programs and finished her general surgery residency at the University of Wisconsin in Madison (2008 to 2011). 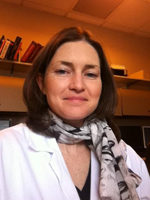 She completed several clinical research studies on surgical outcomes during her time in Wisconsin. She passed her boards and became a board-certified general surgeon. Kaitlyn then matched in a fellowship training program in the specialty of surgical oncology at Memorial Sloan-Kettering Cancer Center where she continues to train at the present time (2011 to 2013). She was just hired as a surgical oncologist at UC San Diego and she will begin her new job in June 2013. She will specialize in surgery for gastrointestinal cancers. In addition to everything mentioned above, Kaitlyn has 24 peer-reviewed original research studies in publication and she has written three chapters in surgical textbooks. She has also presented original research at sixteen different national conferences. Kaitlyn has devoted her life to cancer patients and cancer research. These are her own words: “I want to be a superb surgeon and offer my patients the best quality cancer care available. I plan to achieve national stature in my research career and to impact cancer care standards and outcomes”. Our entire family is very proud of Kaitlyn and all that she has accomplished in her thirty five years of life! Kaitlyn attributes much of her success to the great start she got at the Escanaba Senior High School and her favorite teachers Mrs. Majestic, Mr. Burroughs and Mr. Seehafer.